Manual therapy is one of the cornerstones of treatment here at Curnyn Physical Therapy because it is so effective in achieving both pain control and increased function. When a body part hurts we tend not to move it and the consequences of this add up quickly. Lack of motion leads to not only measurable loss of motion in the joint but also increasing tightness and decreased mobility in the muscles surrounding the joint, and this is a very painful combination. Manual therapy remains possibly the most direct and effective means to reverse this process and not only control the pain but often times quickly improve function. Manual therapy is a hands-on treatment provided by a physical therapist for a patient with a musculo-skeletal or neurological problem. Manual therapy is the skilled passive movement of a joint or soft tissue structure to restore function to that structure. It includes joint mobilization, manipulation, soft tissue mobilization, myofascial release techniques, strain-counterstrain techniques, muscle energy techniques, stretching and many other techniques used in combination to treat neuromuscular and orthopedic dysfunctions. The movement of the joints or bones in a controlled manner. This technique is to help loosen joints and re-establish functional movement patterns. The restoration of muscle play, breaking fascial restrictions between muscles, and decreasing excessive tone that is associated with muscle tightness. Strain counterstrain is a passive procedure that places the body in a position of greatest comfort thereby relieving pain and dysfunction by reducing the inappropriate feedback between the brain and the effected body part. This technique applies a mild overstretch in the direction opposite to that which causes the discomfort. The communication with the brain is “reset” to allow for proper feedback. Muscle Energy Technique focuses on joint range-of-motion limitation, and uses light to moderate force muscular contractions precisely controlled to affect a specific joint and restore normal joint motion. 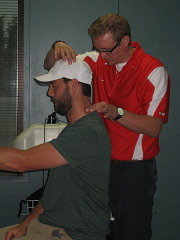 The physical therapist will position the patient in a manner such that the specific joint will be affected. The patient is asked to initiate a muscle contraction to assist in the procedure. At Curnyn Physical Therapy manual therapy is used in conjunction with other forms of therapy, such as therapeutic exercise, neuromuscular re-education, and modalities to achieve optimal results for our patients.